Southern right whales used to be so common in New Zealand that people in Wellington complained of being kept awake at night by the noise of the whales. 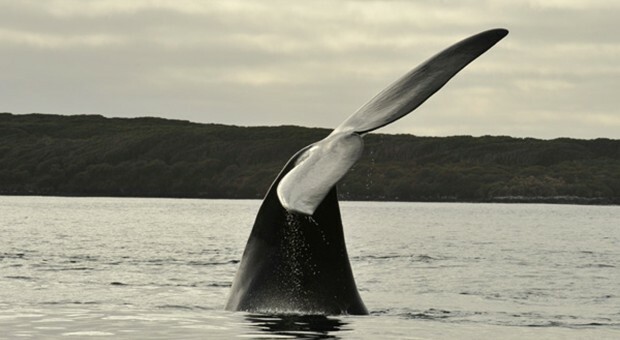 These days, the only places where New Zealand southern right whales can be found in reasonable numbers are at the Auckland Islands and Campbell Island. 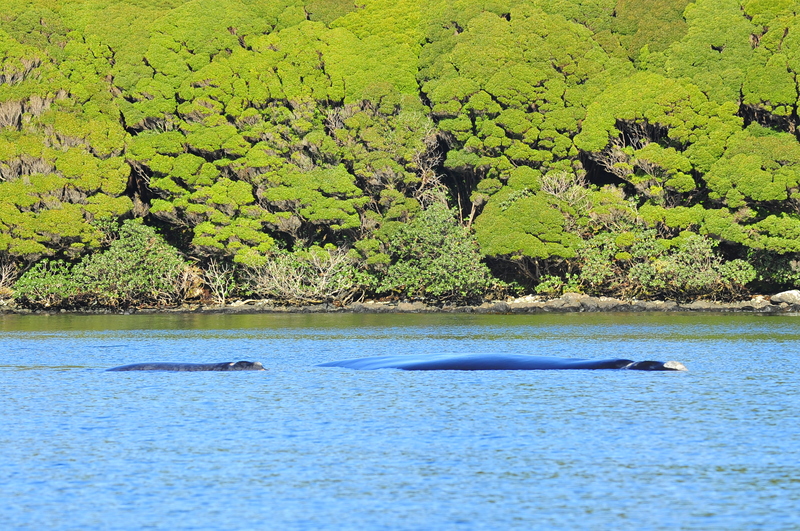 In winter, up to two hundred right whales can be found in Port Ross at the Auckland Islands on any given day. 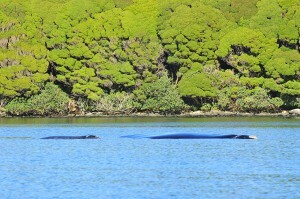 Right whales are seen occasionally off the mainland New Zealand coast, usually in small numbers. These sightings appear to be becoming more common. The New Zealand population is thought to be increasing at about 5% per year, slightly slower than right whale populations off South Africa and South America. Southern right whales were hunted to brink of extinction in the early 19th century, with fewer than 100 whales remaining when whaling ceased. These whales were highly prized by whalers for their oil (used for heating and lighting) and whalebone (or baleen), which was made into corsets and parasols. In 2009 the number of right whales in NZ waters was approximately 2000 individuals, less than 10% of their original population size. Southern right whales are now thought to be recovering steadily, with the NZ population increasing at about 5% per year. 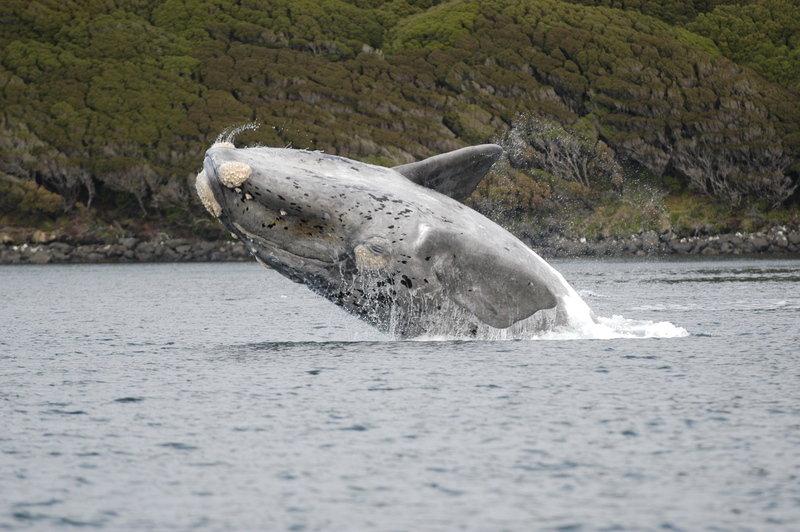 The vast majority of the New Zealand population of southern right whales breeds in the sub-Antarctic Auckland Islands. Right whales are also consistently sighted at Campbell Island, but it doesn’t seem to be an important calving area. There are occasional sightings around the mainland, mostly during winter. Because of the remoteness of the majority of current right whale habitat, threats from humans are minimal; but as whales start to re-colonise former habitats around the New Zealand mainland impacts are likely to increase. The southern right whale or tohorā is a large, stocky, distinctive whale with no dorsal fin and a v-shaped blow. 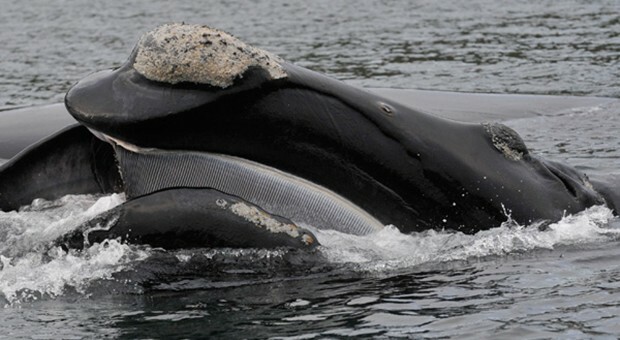 Right whales have callosities (rough growths of keratin on their heads) which are uniquely shaped and allow individual whales to be identified. 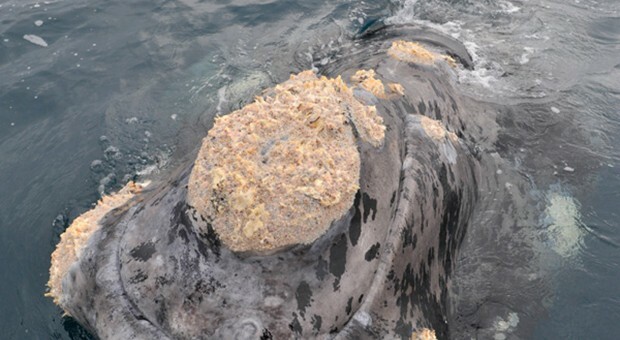 These callosities form patches along the top of their head, along their lips and on their chin and are infested with whale lice (cyamids) which feed on the rough, dead skin. Right whales are filter feeders, sieving high densities of tiny creatures, such as copepods, from the water using their 2-3 metre long baleen plates. 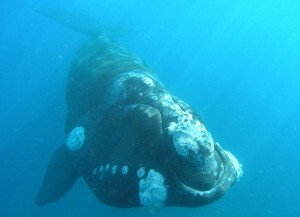 Southern right whales are migratory, spending summers offshore feeding and winters inshore breeding and calving. Currently the subantarctic Auckland Islands are thought to be the primary calving ground in NZ waters. Whales congregate in the shallow, sheltered waters of Port Ross to give birth and nurse their calves. Right whales are remarkably long-lived, likely reaching 100+ years old. Females typically have a single calf every three years once they mature at ~ 9 years old. The calves grow very quickly due to their diet of rich, fatty milk. As with all marine mammals, sound is extremely important for southern right whales as a means of communication. Right whales produce a wide range of low frequency calls including moans, impulsive gunshot sounds, upcalls, downcalls and noisy blows. Since their protection in 1935 and the cessation of whaling, southern right whales in New Zealand waters have faced minimal conservation problems. But this is no reason for complacency, it is likely that once these whales re-colonise former habitats, particularly those along the mainland coasts overlapping with human activities, the potential for adverse impacts will increase. We can learn much from the harsh lessons with the North Atlantic right whale. A close relation of the southern right whale, the 400 whales in the North Atlantic have suffered 24+ deaths from ship strike since 1970 and over 75% of live whales have scars from entanglement in fishing gear. Their effective area for communication has also been reduced by 90% over the last 100 years due to noise pollution. The whales modify their calls when ship noise is loud by shifting their frequency and calling less often. Additionally there are the cumulative impacts of pollution, ecosystem effects of fishing and climate change. One focus of our research is to provide an accurate estimate of the current population and the rate of population recovery. Using whaling records and current habitat preferences at the Auckland Islands we will also predict which areas in New Zealand are likely to be preferred habitat for the whales. This research will enable us to be proactive when managing this recolonising population by predicting where threats are likely to be greatest (e.g. plans for marine farms and other human activities in the whales’ habitat and migration routes). Focusing our research on understanding different right whale sounds, understanding the context in which they are made and examining background noise, will also help us to understand the significance of acoustic pollution and its potential impact on right whale recovery. By finding out more about the recovery of New Zealand’s southern right whale population and their habitat preferences, we will also be able to provide management advice. This will help ensure that protection is implemented in a positive and proactive way, minimising conflict and avoiding the impacts faced by other right whale populations. Moving shipping lanes, assigning whale spotters to boats, introducing speed limits and educating mariners to avoid ship strike. Establishing Marine Protected Areas to reduce the risk of entanglement in fishing gear. Establishing Aquaculture Management Areas to minimise the displacement of whales. Applying regulations, enforcing them and completing clean-ups to avoid impacts of pollution. In the North Atlantic, for example, there has been great success in reducing ship strike by modifying shipping lanes very slightly to avoid areas of high whale density. Rayment, W., Dawson, S. and Webster, T. 2015. Breeding status affects fine-scale habitat selection of southern right whales on their wintering grounds. Journal of Biogeography 42: 463-474. Carroll, E., Rayment, W., et al. 2014. 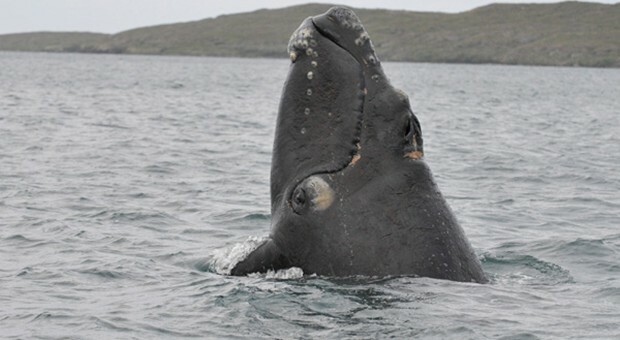 Re-establishment of former wintering grounds by New Zealand southern right whales. Marine Mammal Science 30: 206-220. Rayment, W., Davidson A., Dawson S., Slooten E. and Webster T. 2012. Distribution of southern right whales on the Auckland Islands calving grounds. New Zealand Journal of Marine and Freshwater Research 46: 431-436.